Oreo is a well known cookie brand which instills in its customers, a need to twist it apart or dunk it in milk. But Oreo, the brand is also a social media dynamo. 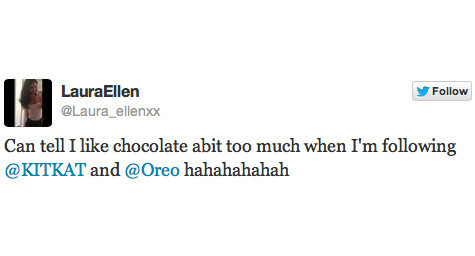 At the time of the tweet, Oreo had 65,000 followers on Twitter. By the time the lights came back on, Oreo had racked up over 10,000 RTs (retweets) and thousands of “favorites” and positive replies – all with a single tweeted image. The Daily Twist campaign celebrated the 100th anniversary of the Oreo cookie with 100 ads in 100 days. Each day, Oreo’s team would turn a current event into an ad featuring a cookie like the Mars Rover landing or Elvis Day. During the 100 days, Daily Twist gained over 1.3 million Facebook interactions — Likes, comments and shares — a 195 percent increase from the previous three-month period. The share rate increased by 280 percent, and each post was shared an average 1,472 times. This led to a 150 percent increase in total Facebook reach. The Daily Twist campaign was also featured in more than 2,600 articles from media outlets around the world. After a Twitter user tweeted that her “love for chocolate” had her following both Kit Kat and Oreo on Twitter, Kit Kat issued a challenge to Oreo for a game of tic-tac-toe to prove which brand was worthy of the tweeter’s affections. Both brands experienced a win-win from the free publicity. Twitter was flooded with tweets about the brand battle as their fans spread the word in support of their favorite snacks. But Oreo ultimately had the last word, when the cookie brand politely declined to play by tweeting an image of a Kit Kat with a bite taken out of it and a comment about the candy being too delicious to resist. Looking at the analytics the Oreo reply got 336 retweets and 267 favorites, while the Kit Kat challenge got 266 Retweets and 187 favorites. Brands are starting to realize that they can help each other by communicating not just with their customers but also with other brands. It shows a more human side of brands and the ability to create fun, quick responses is entertaining. 1. Be Timely and Topical : Make a calendar of holidays and upcoming events, and plan posts around them. 2. Promote Consistently and Frequently: Consistency and frequency played a big role in the success of both the Super Bowl tweet and the Daily Twist campaign. Try to post at least a couple of times each day, and build up your social community. 3. Use Graphics & Keep it Simple : All of Oreo’s social media campaigns are simple and have relatively high production quality. 4. Have Fun: Social media is supposed to be social and each of Oreo’s social media campaigns above were meant to make people smile. If you can make someone smile, your following will begin to grow. If you have concerns as to the accuracy of anything posted on this site please send your concerns to Peter Carr, Program Director, Social Media for Business Performance.